PORT MORRIS — Jamie Jones retreated to a back room of her second-story print shop on East 135th Street when Sandy blew into the city last week. As Sandy’s gusts gathered force that Monday afternoon, they pummeled the giant billboard attached to Jones’ roof, rattling the old brick building below. The building convulsed until, about 3 p.m., a roaring crash sounded from above. “I dropped to my knees and said, 'This is it,'” recalled Jones, 41. Finally, the crash ended and there was silence. Jones peeked out of the room. “There was nothing but smoke and dust and debris,” she said. When the dust cleared, she found a gnarled, 1,200-square-foot chuck of ceiling lying on the floor of her studio. 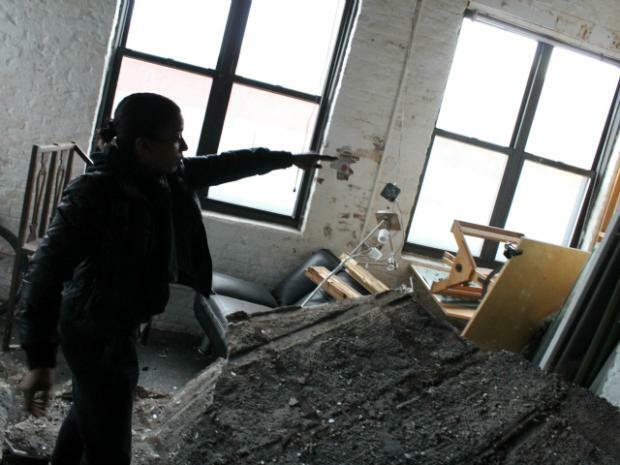 Jones’ business was one of several that suffered major storm-related wind damage and flooding in Port Morris, an industrial corridor along the Harlem River where a tiny, hip outpost of shops and lofts has operated for years. 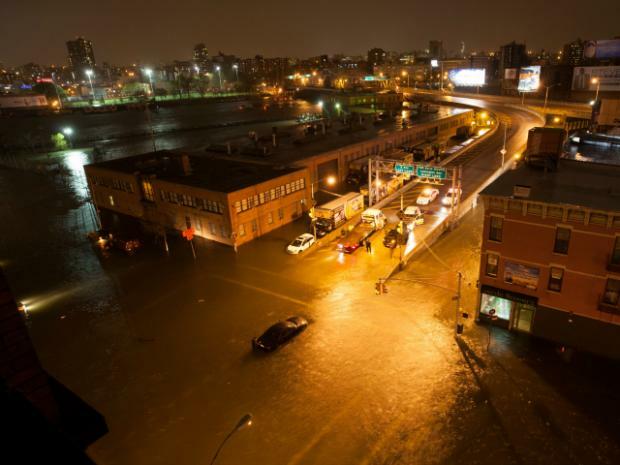 When tides peaked during the storm late on October 29, the river surged more than a block inland and several feet above street level, partially submerging parked cars and flooding several businesses along Bruckner Boulevard. Among them were Verde Flowers, a chic floral design company, and Bruckner Bar and Grill, a South Bronx institution popular among artists, teachers and politicians, and everyone in between. “Monday night, this was all a huge river,” Bruckner’s general manager, Joseph Diaz, said last week in the restaurant’s dank, unlit dining room. The restaurant still has not regained heat or electricity. When floodwaters filled the restaurant’s basement nearly to the ceiling last week, the saltwater and sewage destroyed microwaves, dishwashers, meat slicers, refrigerators and other expensive machinery. Because the restaurant had stocked up on supplies before the storm, thousands of dollars worth of alcohol and food, including cheese, shrimp, steak and about 50 cases of craft beer all perished, Diaz said. A sanitation worker waited for an hour-and-a-half one day last week while Bruckner staff piled the spoiled food into a garbage truck, Diaz added. Some floodwaters reached the upstairs dining and performance rooms as well, which warped the floors and caused a $10,000 stereo system to malfunction, Diaz said. He added that the restaurant hopes to reopen within a month, but during that time many of its 22 staffers will be out of work. In the meantime, Bruckner must find funds to rebuild. When its owners bought insurance, they were told the restaurant was ineligible for flood insurance, Diaz said — a message that Verde Flowers’ owners said they also received from their insurer. Both businesses have turned to local and federal government agencies for help. The city, in partnership with Goldman Sachs, is offering Sandy-damaged small businesses loans of up to $25,000 with an eventual 1% interest rate. Firms can also receive up to $100,000 in sales tax exemptions for rebuilding costs, access free temporary workspaces and enter employees into shared work or disaster unemployment programs administered by the state, according to the city's Small Business Services Department. The federal Small Business Administration is making loans worth up to $2 million at a 4 percent interest rate for businesses to make disaster repairs or replacements. But as they confront lost sales and ruined merchandise, neither Bruckner nor Verde is eager to take out new loans. Both had hoped FEMA would offer some immediate financial assistance — but they were referred to SBA and its disaster loan program. Verde faced eight feet of floodwaters in its basement and two feet on its main floor last week, Polanco said. The water wrecked about $9,000 worth of merchandise, warped the floors and soaked some computers, she added. Jones, meanwhile, estimates that she has already lost out on about $5,000 worth of work at her design and print shop, New York Graphics Studio. The ceiling collapse also damaged thousands of dollars worth of equipment in her loft's photography studio, including props, backdrops, lighting, cameras and computers, Jones said. Already, nearby merchants who were spared by the storm have rushed in to help their neighbors. The Clock Bar plans to host multiple fundraisers, beginning Friday with an event organized by one of Jones’ customers who met her at the Bruckner. It will feature a raffle with goods and services donated by local businesses. “We want people to come and have some fun so the staff at the Bruckner can sustain themselves while they rebuild,” said Frankie Caamano, the fundraiser’s organizer. “And I want Jamie to be able to get her equipment repaired,” said Caamano, who has hired Jones to print T-shirts and flyers for a monthly event he runs, called Art Rapture. “She wants to get back on her feet,” Caamano added. “And I don’t think that’s a lot to ask." Donate funds to Jones and New York Graphics Studio here. Donate to Bruckner Bar and Grill here. Friday's fundraiser at The Clock Bar costs $10, to be donated to the two businesses, and goes from 7 p.m. to 1 a.m.